The Adjaruli khachapuri from No. 1 Sakhachapure in Tbilisi, Republic of Georgia. TBILISI, Republic of Georgia – Whatever you can make with flour, water, eggs, and cheese the Georgians make. That includes many turnovers in different shapes, crepes, and a variety of flatbreads, something like pizza, called khachapuri. This national dish is so popular, that in some family restaurants, where three generations might be dining together, you see waiters carrying trays heaped with half a dozen. Though some people prefer versions with the inside doughy edges scooped out, this method omits that step. The yeast dough is simple enough to form. A little milk makes it tender, and olive oil in the dough allows you to roll it easily. 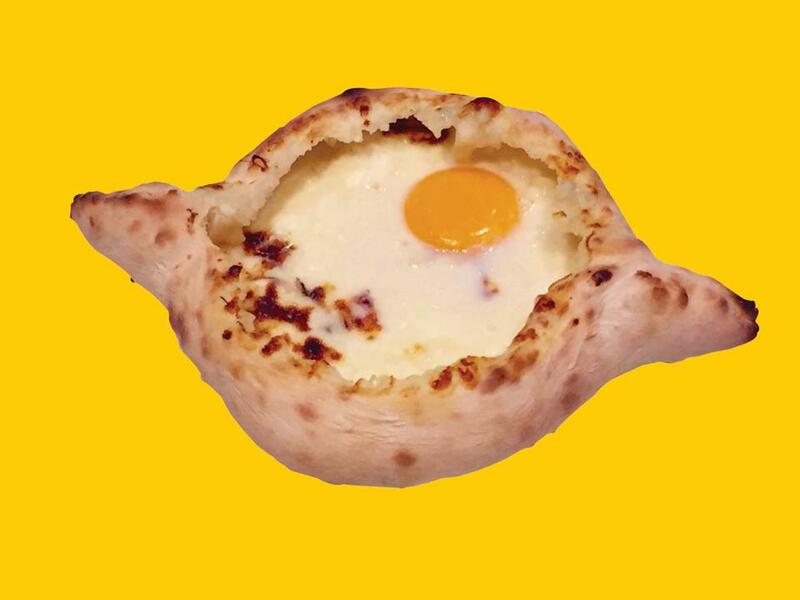 Even if you’ve never seen khachapuri in its place of origin, you can shape it easily. After rolling the dough to an oval, mix grated or crumbled cheese with an egg and milk to make a chunky paste, spread it in the center so it comes to within an inch of all sides. Use your hands to fold up the long sides a couple of times, turning the edges into shallow walls to hold the filling. Take the ends of the folded dough and twist them together to form the boat’s ends. Then send to the oven.